Natural causes or foul play? That's the question Clay Edison must answer each time he examines a body. Figuring out motives and chasing down suspects aren't part of his beat--not until a seemingly open-and-shut case proves to be more than meets his highly trained eye. Eccentric, reclusive Walter Rennert lies cold at the bottom of his stairs. At first glance the scene looks Natural causes or foul play? That's the question Clay Edison must answer each time he examines a body. Figuring out motives and chasing down suspects aren't part of his beat--not until a seemingly open-and-shut case proves to be more than meets his highly trained eye. Eccentric, reclusive Walter Rennert lies cold at the bottom of his stairs. At first glance the scene looks straightforward: a once-respected psychology professor, done in by booze and a bad heart. But his daughter Tatiana insists that her father has been murdered, and she persuades Clay to take a closer look at the grim facts of Rennert's life. What emerges is a history of scandal and violence, and an experiment gone horribly wrong that ended in the brutal murder of a coed. Walter Rennert, it appears, was a broken man--and maybe a marked one. And when Clay learns that a colleague of Rennert's died in a nearly identical manner, he begins to question everything in the official record. All the while, his relationship with Tatiana is evolving into something forbidden. The closer they grow, the more determined he becomes to catch her father's killer--even if he has to overstep his bounds to do it. To ask other readers questions about Crime Scene, please sign up. Have read everything by Jonathan Kellerman. He is my favorite. Friends and fans of Jonathan Kellerman, what author is good to read in this genre while waiting for his next book? Chris Michael Connelly is superb in this genre, I think the very best. I would read his books in order. I am confused toward the end. On Ch. 44. Why does all this matter? Who cares and why should I care? They just dug the bullet out of the tree. I like the writing a lot, but the plot is confusing to me. Is it me or the book? Great new series from father and son team Jonathan and Jesse Kellerman! There are 5 manners of death. It’s up to the investigators in the Coroner's office to determine what category they each fall into. Deputy Sheriff Clay Edison of the Coroner's office is called to a home in the Berkeley area to investigate a seemingly accidental death. A body at the bottom of the stair case. Simple enough - people trip and fall down the stairs all the time, right? Well, the dead mans’ daughter Tatiana is on the Great new series from father and son team Jonathan and Jesse Kellerman! Deputy Sheriff Clay Edison of the Coroner's office is called to a home in the Berkeley area to investigate a seemingly accidental death. A body at the bottom of the stair case. Simple enough - people trip and fall down the stairs all the time, right? Well, the dead mans’ daughter Tatiana is on the scene and is positive he was murdered. She’s doing her best to convince the investigators to see it her way. Against his better judgement, Clay begrudgingly probes deeper than he feels is necessary, only to find that there may in fact be more to this death than just an accidental fall. I've been a huge fan of Jonathan and Faye Kellerman for years reading their separate series and combined efforts. I haven’t read anything from their son Jesse, though I’ve been meaning to. I’m not sure of the contribution of each author to this book but I can definitely feel the flavor of Jonathan Kellerman. His main characters, Alex Delaware and long-time girlfriend Robin make a cameo appearance in this book too! Bonus! The main character Clay is strong and very likeable. We are given a good deal of insight into his background and character, flaws and all! This book reads very easily and quickly. I enjoyed every page, beginning to end. My only issue was there were so many characters, at times I had difficulty keeping them straight. The foundations seem set for this to be a new and potentially long successful series. Fingers crossed! I am definitely a fan of this new series and will be watching and waiting for the next installment. Highly recommend! In another joint effort, Jonathan and Jesse Kellerman seek to hit the reset button after a miserable writing venture about monsters and other such inane topics. After taking a breather, this piece allows their true colours to shine through, crafting a superior series debut novel. Clay Edison has quite the life as a deputy sheriff with the county coroner’s office. Edison attends crime scenes to help move along the manner of death and working to notify families of loss, when appropriate. While the In another joint effort, Jonathan and Jesse Kellerman seek to hit the reset button after a miserable writing venture about monsters and other such inane topics. After taking a breather, this piece allows their true colours to shine through, crafting a superior series debut novel. Clay Edison has quite the life as a deputy sheriff with the county coroner’s office. Edison attends crime scenes to help move along the manner of death and working to notify families of loss, when appropriate. While the job has its macabre side, Edison can find small crumbs of interest, especially when a case takes on an unexpected twist. Attending the scene of an apparent fall, Edison encounters a distraught Tatiana Rennert-Delavigne, daughter of the victim, one Walter Rennert. Edison must calm Tatiana, who is sure that her father’s death was anything but accidental, citing an old murder from 1993 that bore similarities. Unable to provide any concrete answers at the scene, Edison assures the distraught woman that he will be in touch, his brain curious about the aforementioned murder from the nineties. The autopsy seems to back up the suspected accidental death from a fall, showing heart issues, but that only piques Edison’s curiosity even more. Medication prescribed to Rennert seems to have come from an unlikely source and Edison runs a little longer with this 1993 murder to see if there are truly parallels. There appears to be something, as Rennert was a psychology professor running an interesting study in years past, seeking to find a parallel between violent video games and the behaviour that came from it. When one of the test subjects, Julian Triplett, was charged and convicted with the murder of Rennert’s student assistance on the study, the academic exploration’s relevance seems to heighten. Now, all these years later, Edison must try to determine if Triplett could have something to do with Rennert’s death, while not being completely convinced that there was foul play at all. With a handful of cases cluttering up his desk and the desire not to get too involved with Tatiana, Clay Edison must remember the limits to his job and let those in a position of authority crack the case, if there is one at all. The Kellermans prove that they can work together to create a wonderful story and thriller, given the proper tools. I had written them off as a team, but must now rethink my critique, as long as they stick to series like this. Surely, crime thriller lovers will want to test the waters with this piece, which has all the ingredients for a successful novel. I will admit to being a long-time Jesse Kellerman fan and have heard much about his father. Excitement spilt over when I heard they penned a novel together, but that turned to disappointment when I read the poorly crafted piece that significant undershorts the NYT Bestselling Author moniker both have procured. Slowly, I thawed to the idea of returning to one of their novels, seeing others praise this collaboration, and am now glad that I gave them the chance. Clay Edison proves to be an interesting character, packed full with a backstory that will lure the reader in a little further. A college basketball star who remained local, allowing is past glory envelop him for those who remember his court antics. Now, working in that job that straddles the coroner with police authority, Edison’s work pushes him to the limits and allows him a little chance to sleuth around, without the gun or cuffs. Pairing him with a few strong secondary characters, the Kellermans allow Edison’s various character flaws to come through, as well as the strength of his determination. The attentive reader will even see one of Jonathan Kellerman’s protagonists play a cameo role in part of the story, which seems to enrich at least that portion of the tale. The story itself is intriguing, though one cannot call it entirely unique. A killer potentially on the loose and seeking some form of retribution for his crime. It does have aspects of a beaten, dead horse, but it is the way the Kellermans present it that keeps the reader wanting to know more. I am curious, I will admit that, though I am still not sure how deep this series can go. I would like to see more before diving head-long into complete praise, but have seen a great deal of potential here. Kudos, Messrs. Kellerman, as you embark on what I can only hope is a more successful and less asinine journey than Golem work. I am intrigued and hope the literary vapours that seep from your family will create more successful novels soon. Years ago I was a devoted Jonathan Kellerman fan and even read some of his wife's books. Kellerman has a way with prose that is so easy, flowing and gentle that you simply go merrily along from beginning to end. Which, unfortunately, was my problem. I like a bit of a challenge in my reading, whether it's a classic, a comedy or a cozy mystery. Excite me, teach me, tell me something I don't know. Sadly, Kellerman's books are so formulaic that they all just blend together. Crime Scene is written in tandem with his son, Jesse. However, based on the type of writing in this book, I suspect it was written more by the latter than the former. There are passages that don't flow well, references that don't lead anywhere and I honestly thought I had entered a series in the middle because it felt as though I should have known things about the characters that I did not and which were not explained until near the ending of the book. They weren't crucial to the plot, just out of place facts that should have been dealt with up front. The plot itself wasn't bad but, again, it all had been done before and was very predictable from the start. This book does not disappoint! A solid thriller! Crime Scene by father and son duo, Jonathan and Jesse Kellerman, is the first book in a new exciting series that features Clay Edison, a Deputy Sheriff with the Coroner's Office, and former basketball star. Clay will easily become a fan favorite with his winning personality and strong character. Clay Edison finds himself drawn into a complicated investigation, the death of Walter Rennert, a retired psychology professor. His death brings on multiple This book does not disappoint! A solid thriller! Clay Edison finds himself drawn into a complicated investigation, the death of Walter Rennert, a retired psychology professor. His death brings on multiple new questions about an old crime where one of his students was brutally murdered. Tatiana, Walter's daughter, insists he was murdered - pushed down the stairs. Clay believes he died of natural causes - Walter had a history of drinking and heart problems. The more Clay digs deeper into Walter's investigation, the more it seems to have to do with an old case. Will Clay discover the truth? Will he lose his job for digging deeper into the past? Extremely well-written with a well thought out plot and well-developed characters... A fantastic start to a new character and new series! I'm already waiting for the next book. Highly Recommend! Clay Edison is an investigator for coroner’s office of the sheriff's department when he gets a call to come investigate a possibly suspicious death. Arriving at the scene the victim's daughter, Tatiana, has insisted that her father was pushed down his stairway and that it couldn't possibly have been an accident. Tatiana insists her father has been living in fear of a man from his past for years that had already killed someone else. After digging into the scene and the evidence including an autop Clay Edison is an investigator for coroner’s office of the sheriff's department when he gets a call to come investigate a possibly suspicious death. Arriving at the scene the victim's daughter, Tatiana, has insisted that her father was pushed down his stairway and that it couldn't possibly have been an accident. Tatiana insists her father has been living in fear of a man from his past for years that had already killed someone else. After digging into the scene and the evidence including an autopsy of the victim Clay is pretty certain that the death was not a homicide. Something about Tatiana's story though intrigues Clay to look further into her father and his past until he finds himself following clues from years before and unable to just close his current case. Crime Scene is the first book in the new series Clay Edison by Jonathon and Jesse Kellerman. Being new to anything by either Kellerman I was eager to give this book a try after hearing good things and wanting to check out their work. I'm happy to say that this was a nice little mystery/thriller following along the twists and turns to find out the truth to what happened. My only thing I wondered about while reading this story that had me a bit curious was Clay only seems to keep digging into the case due to his attraction to Tatiana, not sure if I find that completely believable as most would have a lot more work coming their way. I also found this a tad slow in parts to me but still enjoyed the story quite a bit and will definitely look for more from the Kellermans. Gosh that Jonathan Kellerman fella sure can write. I can tell from all of the awards he has won over the years. Seriously now, wife Faye Kellerman is also an outstanding writer, so son Jesse has some serious writing chops in his background. Jonathan and Jesse have teamed up to write the first in a series featuring Clay Edison, a deputy assigned as a death investigator with the Coroner's bureau of Alameda County in California. Edison's job is strictly to help determine the manner of death whethe Gosh that Jonathan Kellerman fella sure can write. I can tell from all of the awards he has won over the years. Edison's job is strictly to help determine the manner of death whether it be homicide, suicide, accidental, natural causes or undetermined. He investigates the scene of the death looking for information that would aid in the determination. Is there a shoe untied on the body near a flight of stairs? Is there a knife sticking out of the body? It is not Edison's job to figure out the who or the why, just the how. But in the recent death of Dr Walter Rennart he is drawn into a deeper investigation by the doctor's beautiful daughter Tatiania who insists her father was murdered despite everything pointing to a natural death. It is an earlier murder of a young coed that Dr Rennart lost his reputation over that soon piques Edison's interest. There is a special delight in getting in on the ground of a new series, especially one that seem like it will go places. Clay Edison is a thoughtful character who has much room to grow in the following books. I've always read Jonathan Kellerman. He writes a hell of a story. Problem is, I'm not overly fond of elitist Dr. Delaware. So I am hoping I continue to like Clay Edison as much as I do in this book. I'm not sure if this makes much sense but I really liked the plot, it was very well -written, however the whodunnit was way too easy to figure out. I didn't feel challenged at all. I mentally took half star off for using the word spectating. Why did spectate/spectating as a verb suddenly start showing up? What's wrong with watch? Maybe Edison was just using it ironically. This is a great start to a new series. Oh heck, I just realized the drawback of a new series, waiting another year for the next installment. If the name Kellerman is on it, it's a pretty sure bet I'll like it. Over many years, I've devoured just about every book by Jonathan, his wife Faye, and their son Jesse. I've also learned, though, that collaborations don't always live up to their hype, and sometimes the first book in a series falls flat. But neither am I one to look a gift horse in the mouth: Pass up an opportunity to read an advance copy of anything written by favorite authors in exchange for an honest review? Just ain't gonna If the name Kellerman is on it, it's a pretty sure bet I'll like it. Over many years, I've devoured just about every book by Jonathan, his wife Faye, and their son Jesse. I've also learned, though, that collaborations don't always live up to their hype, and sometimes the first book in a series falls flat. But neither am I one to look a gift horse in the mouth: Pass up an opportunity to read an advance copy of anything written by favorite authors in exchange for an honest review? Just ain't gonna happen. And honestly? I enjoyed it thoroughly. Perhaps most importantly, I really love the new character, Clay Edison, a deputy in the Coroner's Bureau (a bit of a twist on the standard-issue police detective). He comes with a few flaws - his brother is in jail, a serious knee injury put the kibosh on a possible superstar career in basketball, and he's got a shaky relationship with his parents. There's also no main squeeze, thus paving the way for him to be at the mercy of any gorgeous female character he meets. On the other side, while his degree in psychology doesn't put him anywhere near the big leagues, it does give him a leg up when it comes to reading people, whether they be co-workers (like his hypochondriac partner Zaragoza), victims or perpetrators. As this one begins, reclusive former psychology professor Walter Rennert is found dead by his daughter Tatiana (cue in that gorgeous female character). It appears that daddy simply fell down the stairs, but Tatiana insists her father was murdered. She continues to believe that even after the evidence reveals that his history of drinking and a bad heart are to blame. Clay, of course, is intrigued with Tatiana and agrees to take a closer look, to the dismay of his superiors who want the case closed. As he digs deeper, he learns that Rennert resigned in disgrace when a coed was murdered by a mentally unstable participant in one of the professor's experiments. A few other clues throw more suspicion on the circumstances surrounding Rennert's death; and the deeper Clay digs, the more he wants to know about that experiment and precisely what went wrong. That, in turn, means Clay must call on one of Kellerman Senior's best-known characters, Dr. Alex Delaware, for help. The psychologist and LAPD consultant, it seems, had offered expert testimony at the trial of the young man who confessed to the coed's murder, who has since been released from jail. As an aside, Dr. Delaware has long been on my Top 10 list of favorite male characters, so I was happy to see him show up here. But I must say I thought he came across a bit snarky during his meeting with Clay, even allowing for the constraints of doctor-patient privilege. Then again, maybe it was just me; as I was reading that part, I realized I'd been so engrossed that I'd kept reading more than an hour past my usual dinnertime. In the end, as I said at the beginning, this is a very well written book with interesting, well-developed characters (especially Clay). Already, I'm looking forward to his next appearance. A police procedural from a different perspective, from the Coroner..Wonderful writing by Jonathan and Jesse Kellerman, father and son! I have long been a fan pf anything Jonathan wrote and this story is no exception. Deputy Sheriff Clay Edison works in the coroners office, where he tries to put peoples minds at ease when investigating the death of a loved one. Called to a 'fall' death, he meets the daughter of the deceased, a young woman who believes her dad was pushed/murdered. This starts an i A police procedural from a different perspective, from the Coroner..Wonderful writing by Jonathan and Jesse Kellerman, father and son! I have long been a fan pf anything Jonathan wrote and this story is no exception. Deputy Sheriff Clay Edison works in the coroners office, where he tries to put peoples minds at ease when investigating the death of a loved one. Called to a 'fall' death, he meets the daughter of the deceased, a young woman who believes her dad was pushed/murdered. This starts an investigation in which Clay has to question himself,what is he hoping to prove, and how far is he willing to go behind the work of fellow officers! AS he keeps investigating there is pushback from other cops who worked a connected case years ago,putting Clay's job in jeopardy. The characters are strong, you either like someone or you don't,with intense scenes as this young officer keeps investigating where others feel he doesn't belong..I really enjoyed the viewpoint from the coroners office, causing this to be 'not your regular police story',an enjoyable read and great teamwork from the Kellermans.. I received a copy of this book from Netgalley, the author and publisher from which I am able to write my thoughts and I thank them. I liked The Murder Book one of Jonathan Kellerman's earlier books, much better than this one. The paperback Crime Scene I'm sorry to say I just didn't get into. I liked this book. I liked the mix of psychology and forensics. The characters are likable , at least the ones you’re supposed to like are. I’ll read more. Definitely. This book was VERY different from the usual Kellerman books. It was really a story about going above and beyond the call of duty for no other reason but it being the right reason. Deputy coroner Clay Edison was a charmer that I could clearly visualize from the words written about him. I hope this isn't the only glimpse into his life that I'll get. Thanks to NetGalley and the publisher for my copy to review. Started off good but fell flat. More boring then exciting. I read The Golem of Hollywood by this father-son duo, and I loved it. Not surprising, my favorite fiction couple is Alex Delaware and Milo Sturgis (psychiatrist and police detective duo from the mind of Jonathan Kellerman). But I felt like I struggled through more of this story than I would like. The characters felt one sided and the crime solving was making such big leaps that even the other characters were telling Clay Edison that he needed more. It had a fairly consistent flow, it just felt so...flat. It was a lot of Clay did this, and did this and then he did that. and neither the characters nor the plot had much development beyond the presentation. I’ve read a few of the Alex Delaware series but I kind of lost interest. I was hesitant to read this book written with his son but the reviews seem to like it so I gave it a shot. I’m glad I did I really enjoyed it. It was quick paced and I found the main character quite interesting. This series definitely seems promising. Would give it a 2.5. Co-written with his son Jesse, the start of a new series featuring Clay Edison, a deputy coroner in Alameda County in California. Will have to see how it goes as I am reading through the book. It's different from solo books by Jonathan, much looser. I have always enjoyed the Alex Delaware books. Alex Delaware had a cameo in chapter 12, which was the extent of his connection to this story. The book would have benefitted from some serious editing. It wandered, so I found it har Would give it a 2.5. Co-written with his son Jesse, the start of a new series featuring Clay Edison, a deputy coroner in Alameda County in California. Will have to see how it goes as I am reading through the book. It's different from solo books by Jonathan, much looser. I have always enjoyed the Alex Delaware books. Alex Delaware had a cameo in chapter 12, which was the extent of his connection to this story. Hhmm.....I liked it but didn't love it. Full review to come. The plot was very slow to start. By page 98 I was wondering whether reading on was worth the effort. I did continue and the action picked up a bit, but I never felt as if this an "edge of your seat" story. Protagonist Clay Edison is a likable character; his job as a deputy sheriff in the coroner's office the basis of the action. He becomes personally embroiled in what clearly appears to be a natural death when he beds the decedent's daughter. The route to justice is long and winding. Father and son authors Jonathan and Jesse Kellerman collaborate on a thrilling new mystery, “Crime Scene,” the first in a new series. Former star athlete turned deputy coroner Clay Edison is presented with a case of accidental death — or so it seems to the young deputy at first glance. It is one of many peculiar cases that land in the deputy’s hands. Reclusive, eccentric, once-respected psychology professor Walter Rennert lies dead at the foot of his staircase. What looks like a case of booze and Father and son authors Jonathan and Jesse Kellerman collaborate on a thrilling new mystery, “Crime Scene,” the first in a new series. Reclusive, eccentric, once-respected psychology professor Walter Rennert lies dead at the foot of his staircase. What looks like a case of booze and a bad heart to Clay quickly turns into a full-fledged investigation, as Clay quickly learns of the victims’ family members and close friends who all wanted the old man dead. A catalog of suspects begins to collect on the coroner’s investigation list of people to interview, and soon Clay is embroiled in an old-fashioned case of cold-blooded murder. Some of the suspects prove difficult, not answering the deputy’s questions and prolonging the investigation. A romantic subplot between Clay and the victim’s daughter adds character and suspense to the story, but does not advance the plot, and is mostly filler. Crime Scene is the first in the Clay Edison series, written by a father and son team. Big thanks to Net Galley and Random House Ballantine for the DRC, which I received in exchange for this honest review. I rate this mystery 3.5 stars and round it upward. Edison is a coroner’s investigator, and he finds himself drawn into an ugly, complicated murder, seduced by the lovely Tatiana, who I find myself disliking much earlier than the protagonist does. There’s the psychological component here that’s Crime Scene is the first in the Clay Edison series, written by a father and son team. Big thanks to Net Galley and Random House Ballantine for the DRC, which I received in exchange for this honest review. I rate this mystery 3.5 stars and round it upward. Edison is a coroner’s investigator, and he finds himself drawn into an ugly, complicated murder, seduced by the lovely Tatiana, who I find myself disliking much earlier than the protagonist does. There’s the psychological component here that’s similar to the movies, where the audience yells, “Don’t go through that door” as the main character strolls obliviously forward; however, where the Kellermans take the story once Edison has wised up is interesting, original, and well played. I would like to thank Netgalley and Headline for a review copy of Crime Scene, the first novel to feature Coroner's Deputy Clay Edison, set in the Bay Area. Clay is called out to assess a death scene. Walter Rennert has apparently had a cardiac event and fallen down the stairs. His daughter, Tatiana, insists he was murdered and offers as evidence the fact that his former colleague and friend died in the same way. Although it is not his job Clay's attraction to Tatiana convinces him to take a look I would like to thank Netgalley and Headline for a review copy of Crime Scene, the first novel to feature Coroner's Deputy Clay Edison, set in the Bay Area. Clay is called out to assess a death scene. Walter Rennert has apparently had a cardiac event and fallen down the stairs. His daughter, Tatiana, insists he was murdered and offers as evidence the fact that his former colleague and friend died in the same way. Although it is not his job Clay's attraction to Tatiana convinces him to take a look at the old case and what he discovers is a real can of worms. I thoroughly enjoyed Crime Scene. Messrs Kellerman are experienced writers so they know how to grab and hold the reader's attention and I was glued to the pages from start to finish. I like that the novel starts as one thing, an investigation into Walter Rennert's death, and morphs into a completely different investigation. Looking back on it logically it doesn't make total sense that Clay would pursue this secondary investigation so zealously on his own time but curiosity is not always sensible. During the course of my reading this thought did not cross my mind as I was so caught up in Clay's investigation and desperate to know what would be coming next. It is an interesting choice to make Clay a Coroner's Deputy rather than a detective. To me it seems that he gets the best of both worlds, the ability to freelance but with access to police files. A Coroner's Deputy is an officer but their remit is to examine the body to determine if it requires an autopsy, identify it and comfort relatives so no real investigative work is involved and Clay steps well beyond that. He is a nice guy, good at his job and motivated to do right by his bodies and their families. Don't, however, let the nice guy image fool you. He is a former top class college athlete who had to give it up through injury and he applies the same relentless drive that brought him basketball success to his investigation. He never lets up. When an old man, Walter Rennert, falls to his death after having a heart attack his attractive daughter informs Clay (the deputy coroner) that he was murdered and that a former colleague of his also fell to his death not to long ago after a killer who took part in one of their studies was released from prison. Clay puts off ruling the death natural causes in order to appease the daughter that he soon starts sleeping with until he discovers that she is sleeping around. But by that time he is convi When an old man, Walter Rennert, falls to his death after having a heart attack his attractive daughter informs Clay (the deputy coroner) that he was murdered and that a former colleague of his also fell to his death not to long ago after a killer who took part in one of their studies was released from prison. Clay puts off ruling the death natural causes in order to appease the daughter that he soon starts sleeping with until he discovers that she is sleeping around. But by that time he is convinced that the juvenile boy who was convicted of a lab assistants murder was innocent and that the true killer was the colleague who died under mysterious circumstances. He soon discovers that Rennert suspected the same thing and went to confront his colleague. Believing that he had murdered the man Rennert never came forward with his allegations but helped they young boy who was framed find a doctor and a place to stay out of town where he would be safe if the police suspected him of the murder. Clay Edison, deputy coroner, heads to a call of a body at the bottom of a staircase. Preliminary contact with the scene seems to indicate an accidental fall. However, the man's daughter is there and insists her father has been pushed to his death. Clay doesn't really suspect murder but he finds a couple of items in the home that seem a little out of place and his gut feeling tells him there is more to this story. I learned about the investigators in the coroner's office. I guess I've always equa Clay Edison, deputy coroner, heads to a call of a body at the bottom of a staircase. Preliminary contact with the scene seems to indicate an accidental fall. However, the man's daughter is there and insists her father has been pushed to his death. Clay doesn't really suspect murder but he finds a couple of items in the home that seem a little out of place and his gut feeling tells him there is more to this story. I learned about the investigators in the coroner's office. I guess I've always equated autopsy = coroners = medical examiners so I'm glad to be educated about the differences. This is a tightly written thriller with a lot of elements that really work, from the characters to the plot. The pacing is steady, so it never feels like it lags or slows down. This looks like the first book of a series that I'm going to be a huge fan of. Solid thriller. Deputy Coroner Clay Edison has a case he is troubled over the cause of death and he decides to hold off closing it while he does some detective work and ends up with more then he bargained for. I like Jonathan Kellerman so I was interested to see how his son would do. The secondary characters seemed to come straight out of central casting. We had the obnoxious rich wife, the temptress daughter, the alcoholic ex-detective, the doubting superior, and on and on. Clay Edison, the main character, had nothing to set him apart from the 140,000 other main characters. Even the plot line – a police official (in this case a coroner’s investigator) continues to pursue a case he’s b I like Jonathan Kellerman so I was interested to see how his son would do. Even the plot line – a police official (in this case a coroner’s investigator) continues to pursue a case he’s been told to drop – has been done enough times to qualify as a cliché. Characters hinted at things then never explained them to the reader. Some of the conversations – mainly those set in the morgue – were near to impossible to follow. The first one in chapter 5 was especially confusing. I read it, it made no sense, I read it again, and it still made no sense. Two more readings didn’t change that. It was an attempt to capture a multi-person conversation, but it just did not work. The last 38% of this book was tagged as page 411 in this download. By my calculation, if page 411 is 62% of the book, then this book is actually 662 pages long. Amazon, B & N, and several other sites all show this book running around 400 pages in every format. Whether the screw-up is in the first 62% or the last 38% of this download, Amazon continues its masterful ineptitude of page numbering. And what do we get in those around 408 or possibly 662 pages? A slow-moving, dull, plodding story with no tension and as engaging as a grocery list. I usually enjoy Jonathan Kellerman's books, but this one, written together with his son, is blah. To start with, I couldn't figure out what exactly Clay Edison's role in law enforcement is. He seems to be a sheriff's deputy who works in the morgue. So he's not a detective and he's not a medical examiner and it seems that as soon as he starts asking questions, he's trespassing on other people's turf. Second, he had a short brilliant career as a basketball player in college, but was definitely sid I usually enjoy Jonathan Kellerman's books, but this one, written together with his son, is blah. To start with, I couldn't figure out what exactly Clay Edison's role in law enforcement is. He seems to be a sheriff's deputy who works in the morgue. So he's not a detective and he's not a medical examiner and it seems that as soon as he starts asking questions, he's trespassing on other people's turf. Second, he had a short brilliant career as a basketball player in college, but was definitely sidelined by a knee injury. But he seems to have never gotten over those days (even though he publicly denies it) and I find that a rather cheap way of setting up an inner conflict in the protagonist. Third, too much of the story doesn't make sense. When Dr. Rennert is found dead at the bottom of his staircase, the dead man's daughter insists that it was murder, something to do with a lawsuit from a decade earlier, when a subject in psychological research conducted by Dr. Rennert and his graduate student, Nicholas Lindhurst, was convicted of murdering a young woman. Clay gamely starts following up this thread, even after an autopsy shows conclusively that Dr. Rennert died of a dissecting aortic aneurysm. He keeps following up even after the daughter, with whom he's gotten hot and heavy for a night or so, ditches him without warning. And even after she changes her mind and gets angry with him for doing just what she had insisted he do in the first place. Clay is strangely passive through it all. The chronology also doesn't make a lot of sense, especially with regards to the question of when Dr. Rennert acquired a gun. Clay also inexplicably fails to follow up op a clue that is practically flashing a red neon sign saying "this is the link to the missing man" - a prescription for an antipsychotic written by a urologist ! Alex Delaware makes a short cameo into the book, just enough to remind me why I love the Alex Delaware novels and didn't care for this one : those books abound with memorable descriptions of Los Angeles and secondary characters that sound like people you'd want to meet (if only to marvel at how awful they are). And Milo Sturgis, Alex Delaware's detective friend, can always be counted on to deliver some cynical one-liners. I always feel compelled to keep on reading those books, whereas this one was more of a dutiful slog, hoping for a brilliant ending - that never happened. 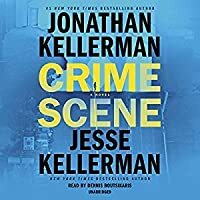 “Crime Scene” by Jonathan Kellerman and Jesse Kellerman is a look at police procedure crime thriller written from a different perspective, that of a coroner. Clay Edison has worked in the Alameda County Coroner’s for five years. Clay’s days are filled with the ordinary and the very unordinary. “Crime Scene” is written as a first person narrative by Clay, and this strategy delivers an interesting and insightful look at Clay’s feelings and at the events that surround him. He talks to the readers a “Crime Scene” by Jonathan Kellerman and Jesse Kellerman is a look at police procedure crime thriller written from a different perspective, that of a coroner. Clay Edison has worked in the Alameda County Coroner’s for five years. Clay’s days are filled with the ordinary and the very unordinary. “Crime Scene” is written as a first person narrative by Clay, and this strategy delivers an interesting and insightful look at Clay’s feelings and at the events that surround him. He talks to the readers as he talks to himself. The dialogue and responses within the story reflect the characters as Clay interacts with them. Geography, problems, questions, feelings, and scenarios are as Clay sees them and makes judgments about them. People weave in and out of Clay’s daily life. Clay’s job haunts him; it lives with him. The work clings to him. He thinks about the dead everywhere he goes. He is not haunted, but he is never quite alone. Every time Clay is called to a location, he is about to ruin someone’s day. Someone is dead, by natural causes or by homicide, but dead. With a click of a button he decides which it is. One case nags at him, presents an underlying question. The case is not even a “homicide” that he feels compelled to solve; it is just that his mind will not let this case go. While trying to resolve this accidental death of an elderly man, he discovers a tangled web of deceit, loyalty, buried secrets, and murders. Secrets from the past creep into the present, and old cases become entangled with recent events. Nothing is really as is appears at first. “Crime Scene” is an interesting new look at crime fiction. It is not a typical murder mystery. There is no graphic violence, no revolting accounts, just regular people doing a distinctly unpleasant job. I was “connected” with Clay and his quest throughout the book. I have read other books by the Kellermans, and this is one of the best. 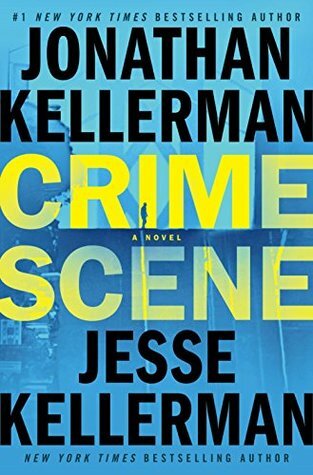 I was given a copy of “Crime Scene” to review by Ballantine Books, NetGalley, Jonathan Kellerman and Jesse Kellerman, and I really enjoyed it. I highly recommend this to everyone.